Take Aim! - monemades Webseite! Why is it that there are never enough hours in a day to do all the things I’d love to do? Sigh. Am I suffering from springtime lethargy or is there just so much to do this time of the year? However, here’s another news I haven’t told you yet about: Last week Knitscene, Accessories 2015 was launched and you can get your digital copy or pre-order your paper copy here. Now, why is that important you ask? 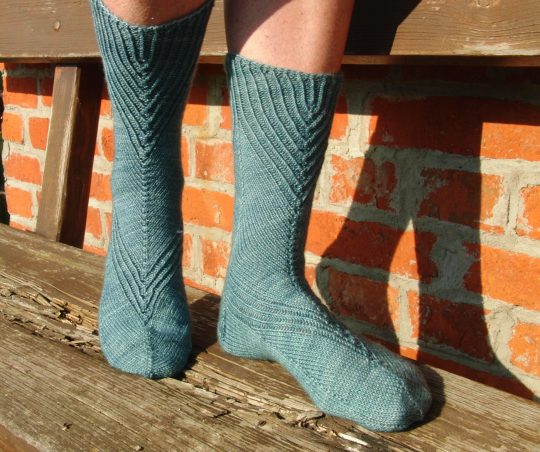 Because I was a lucky duck and one of my sock patterns was accepted for publication. Woohoo! Once again the magazine is filled to the brim with great patterns. And along with a feature about designer Megi Burcl including some stunning shawl patterns, a fancy ‘Little Black Dress’ story with really exceptional projects and some fun home decor projects, one of the themes in this year’s magazine is ‘Capitol Couture’, so patterns inspired by the Hunger Games. There are ten projects representing not only the Capitol but the Districts too and my Nocked Socks are one of them. The first thing that came to my mind when I thought about the Hunger Games was Katniss’ weapon of choice in the arena: Bow and arrow and this is what inspired my design. The short-rows that are used to shape the cuff resemble the nock of an arrow, while the twisted stitches on the leg form the fletching and those on the instep form the arrowhead. The yarn used is Madelinetosh Tosh Sock in colourway ‘Filigree’, which knits up like a dream and has the perfect stitch definition for this design. Here’s my prototype, also in Tosh Sock in another colourway, ‘Well Water’ that made me think of a metal arrowhead, and with a slightly longer arrowhead formed by the twisted stitches. A fun pattern and I really enjoyed working on these socks.